Pencil lines combined with pencil shading can produce surprisingly effective results. All you need is a piece of paper and a pencil....but the trick is learning how to use that pencil. 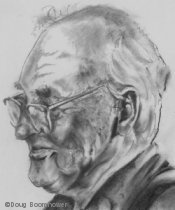 This drawing of Professor Niall McClosky was done with pencil ranging in grade from 2B to 5B. These softer leads are dark, and they are good for shading because they can be easily blended. Shading is just as important as lines are, when it comes to depicting form. 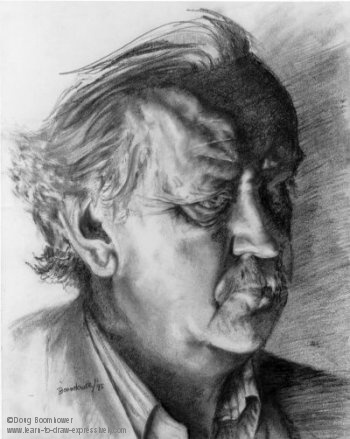 In fact, if you look at this portrait you won’t easily find lines, but what you do see is contrasting areas of shadow. The most discernible lines are around the eye on the left, but notice how these lines disappear into shadow as we approach the bridge of the nose. I shaded this area with a 3B pencil and a blending stump. To do this drawing, I arranged the light in my studio to fall from the upper left. The light source is crucially important because that’s what throws shadows across the form. It’s these areas of light and shade that create volume, or three dimensions. To do this portrait, of course I had to get the outer boundary lines of the face correct, but the emphasis here is on the shading of the inner surfaces of the face. As light falls across the human head, you get a variety of shadows. These different shadows coincide with the different planes of the face. Notice the triangular highlight, which coincides with the shape of the nose. 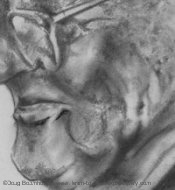 Because the shading here is subtly blended, the viewer’s imagination completes that part of the nose which falls into shadow. Of course the right side of the face is completely in shadow because it is turned away from the light source. Notice the careful pencil shading around the eye on the right. Despite the fact that it is in darkness, I spent as much time drawing this eye as I spent on the other eye. That’s because drawing shadows is such a challenge. You have to learn to suggest more by revealing less. I did this by carefully shading in the pupil of the eye and the eyelashes. I implied the shape of the eye with very subtle highlights, (created with a kneaded eraser) yet the eye remains in shadow. Note the highlights on the forehead. The pencil shading here is also carefully done. First of all you will notice that the highlights and the shadows fall diagonally across the forehead from the direction of the light source. Close observation will reveal subtle differences in tonal values of the shadows...from light, to half-tone, to dark, to darkest. Overall, look at the various shapes of the shaded areas. As just mentioned, there are diagonal shadows on the forehead, a triangular shadow bordering the nose, a curved shadow running from the nose to the month, a curved shadow on the left cheek, a semi-circular shadow under the eye. If you look closely you will find many more. Here's another drawing which demonstrates pencil shading. 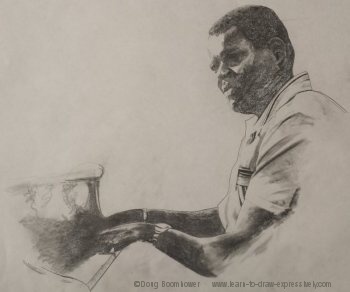 This is a drawing of the late Ike Cruise, a close friend of my wife's. He was a remarkable man, the mention of whose name put a smile on anyone's face who knew him. 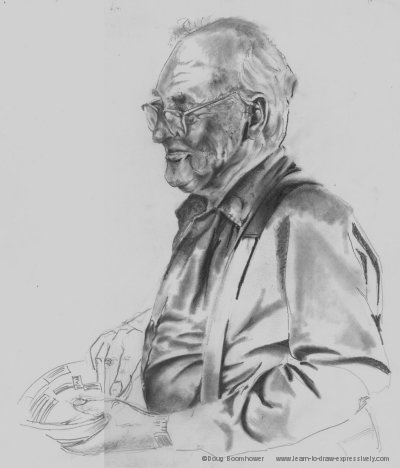 The drawing was done as a preliminary study for a finished charcoal portrait but because of the attention to lighting and the detailed pencil shading, this unfinished drawing will stand on its own. The contour lines which define the boundary of the face and body have been established, but the three-dimensional reality comes from the pencil shading of the different planes within that boundary. This variety of shaded areas combine to create interest and realism. The shape of each shaded area implies different planes. A combination of planes will suggest volume. Notice the chest and stomach area of the shirt. The shadows on the chest run vertically downward following the body's outline, but in the stomach area, the pencil shading changes direction...it runs almost perpendicular to the outline of the body. This is because the weight in the stomach creates a pressure point from which folds radiate horizontally. Therefore, the horizontal planar area at the stomach meets the vertical plane of the chest. Light falls across the face according to each individual's facial structure. Therefore proper shading will clarify the underlying muscle and bone structure of each individual. The highlight on Ike's cheek indicates the top of the cheek (that area closest to the light), but as the naturally rounded shape of the cheek falls away from the light, it darkens as it recedes into shadow. This accounts for the dark shadow surrounding the highlighted area of the cheek. 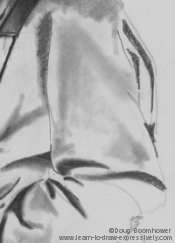 The rule for pencil shading is...planes that turn away from the light are dark (in this case the sides of the cheek). Planes that turn toward the light source are light (in this case the top of the cheek). For another example, look at the lighting on Ike's forehead. As the rounded forehead turns into the light, it becomes highlighted; as it turns away from the light, it becomes darkened. Just as the shapes of shaded areas can suggest different planes, so can the tonal value. 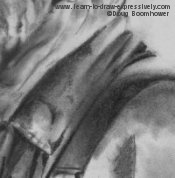 Although the top half of Ike's head is shaded, the overall tonal value is lighter than the values in the facial area. This is logical because if the light is falling from the upper left, the top of the head will not fall under as much shadow as the facial features will. Artistically, this contrast between light and dark also creates more interest. Look at the light tonal shading on the shirt on the upper arm. This light area is surrounded by clearly defined dark shadows and highlights. These tonal contrasts suggest different planes, and thereby give volume to the shirt. Note the "darkest darks" on the face. These very dark shadows contrast against the middle-tone shadows and highlights in the rest of the face, thereby emphasizing the intricacies of the facial structure. The shading on Ike's glasses imply reflected light which in turn creates spacial depth. Notice that the glasses partially cover the eyes, yet the correct dark shading suggests enough of the eyes that the subject's likeness and personality come through. All of this adds up to create a small but realistically three-dimensional area of interest.